Who is the Chief-Justice-to-be on the Louisiana Supreme Court? 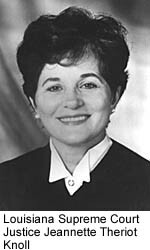 Present Chief Justice Catherine D. Kimball of the Louisiana Supreme Court retires on January 31, 2013, and it looks as though this is Justice Jeannette Theriot Knoll’s chance to get on the top of the ladder of the State’s highest court. Associate Justice Knoll prosecuted Vincent Simmons in 1977. “Any responses by a sitting Justice shall be filed with the Clerk of Court by August 15, 2012,” determines the Chief Justice. The Amendment of July 20, 2012 concerning the new deadline is available at http://www.lasc.org/opinions/2012/2012O1342.pdf . Also read Hon. Bernette Joshua Johnson first African-American chief justice on Louisiana’s Supreme Court of October 17, 2012.